Description - 'Green' friendly, the Homestead collection is something to write home about. Featuring HD imaging technology and slightly distressed edging that emulates the look of natural travertine, this durable porcelain stands out among the rest. The Homestead series shows vast movement within the series, ensuring a unique look across the whole floor. Suitable for residential as well as heavy traffic commercial areas, this travertine porcelain tile is more versatile and easier to maintain than natural stone. Material – Glazed Porcelain with HD technology. Size – Available as 13" x 13", 12" x 24", and 18" x 18" tiles. Minimum Grout Joint Recommendation – 3/16"
Breaking Strength – >700 lbs. Suggested Patterns – Diamond, Offset, or Grid. Weight – Each 13x13 case weighs ~61 lbs, each 12x24 case weighs ~56 lbs, and each 18x18 case weighs ~65 lbs. Recommended Uses – Homestead is recommended for installation in bedrooms, bathrooms, laundry rooms, counter tops, shopping areas, offices, libraries and more. 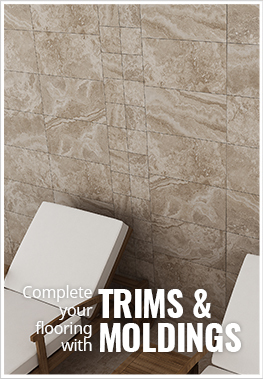 Travertine look with HD technology. High color variation from tile to tile. 'Green' friendly with 4% pre-consumer recycled content. Great for residential, light commercial, and heavy commercial areas.